It remains unknown what uniforms were worn during this period, what patches appeared on the uniforms, or even how many representative matches were played during these years! I'm aware of the QAFL playing rep matches against the WAFL in 2002 and the ACTAFL in 2003 but that's the limit of what I have been able to find. If you can provide further info please contact me. - a throwback to the 1930 Queensland jumper. 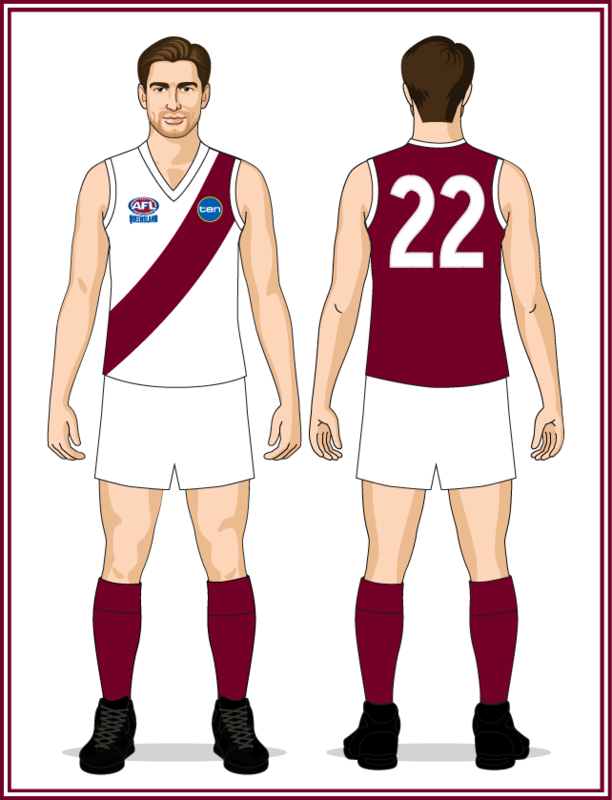 (the QAFL was one of many State Leagues that were re-badged "AFL [State name]" during this period). - modern-style jumper designed to be worn untucked outside the (baggy) shorts. A return to the sash design first worn 1980-89. However, this sash is much thicker than on those '80s jumpers. NOTE - the front and rear sponsors on this uniform are not currently known. If you can provide further info please contact me. Channel Ten logo added to the jumper front, other sponsors = unknown. 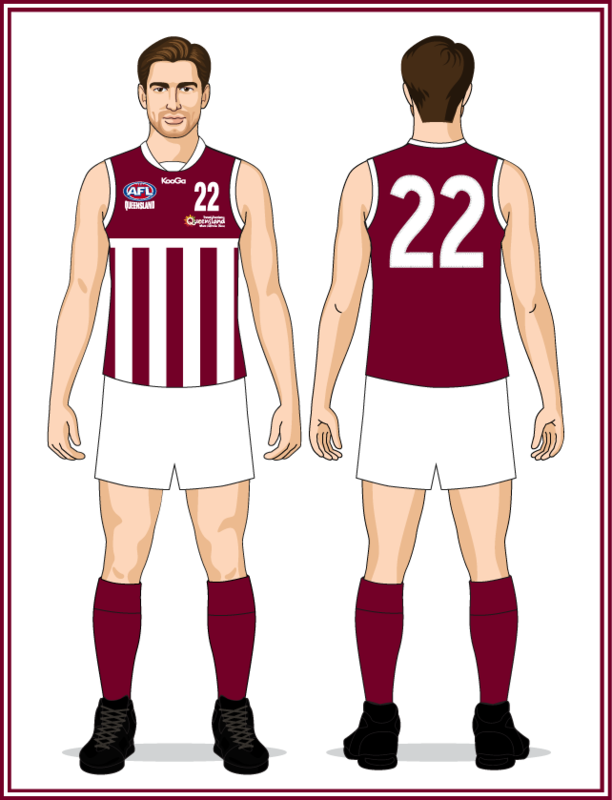 - Queensland added a number to the jumper front for the first time (Western Australia were the first State to do this, starting in 1977). - the new front number was in a different font (arial) to the rear number (the traditional footy font). - a small Powerade patch was added under the front number. 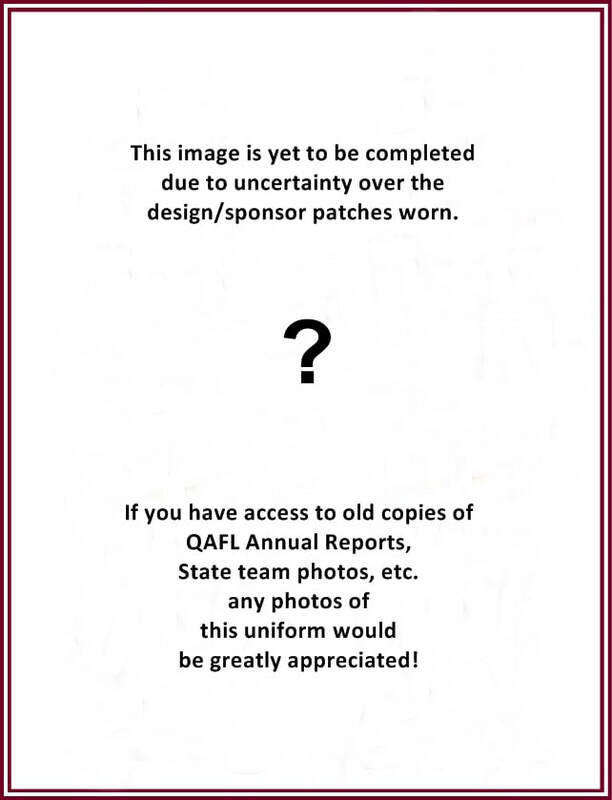 - an Australian Football 150 Years commemorative patch was added under the AFL Queensland logo. NOTE - rear sponsors are unknown at this time. 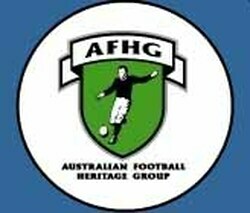 The Australian Football 150 Years patch was no longer worn. 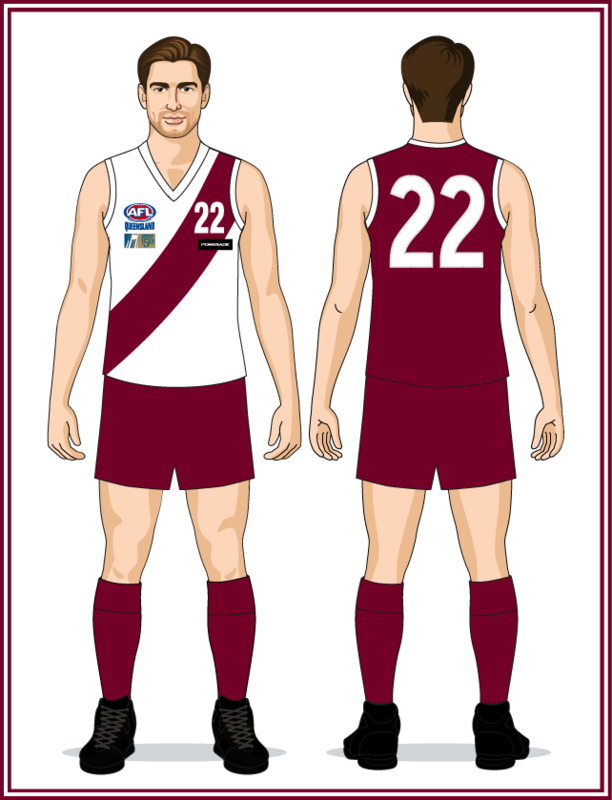 - a return to the Port Adelaide-style "wharf pylons/prison bars" jumper first worn by Queensland throughout the 1990s. - the Powerade patch moved from underneath the front number to under the AFL Queensland logo. Due to a restructure of football along Australia's north-east coast, the best teams from Queensland, Northern Territory, New South Wales and the A.C.T. transferred to a new, conference-based competition - the NEAFL North and the NEAFL East. This NEAFL North representative team was just the second combined Queensland-Northern Territory team ever selected at senior level (the other was the 1993 State of Origin side). - the jumper changed from a V-neck to a circle-neck due to Kooga taking over as apparel sponsor. - Powerade patch dropped from the jumper front. 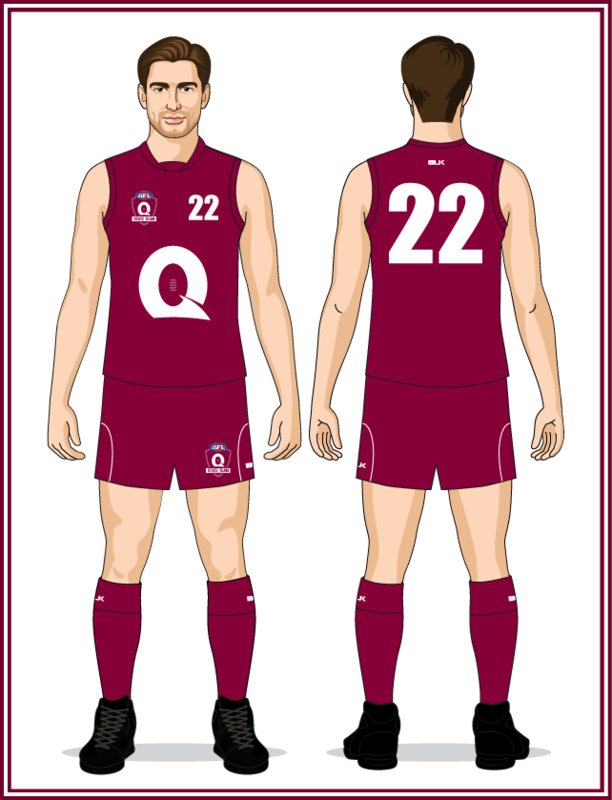 - a Queensland Government Travel & Tourism logo was added to the jumper front. 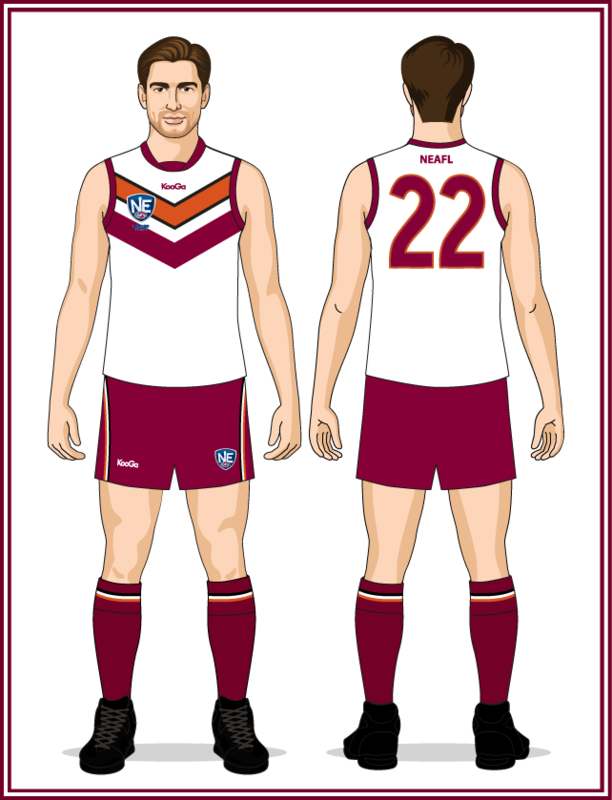 An all-new design intended to incorporate the key design elements of previous QAFL and NTFL representative uniforms - the maroon and white of Queensland and the black, ochre and white of the Northern Territory. This was the same concept applied to the 1993 QLD-NT State of Origin jumper. 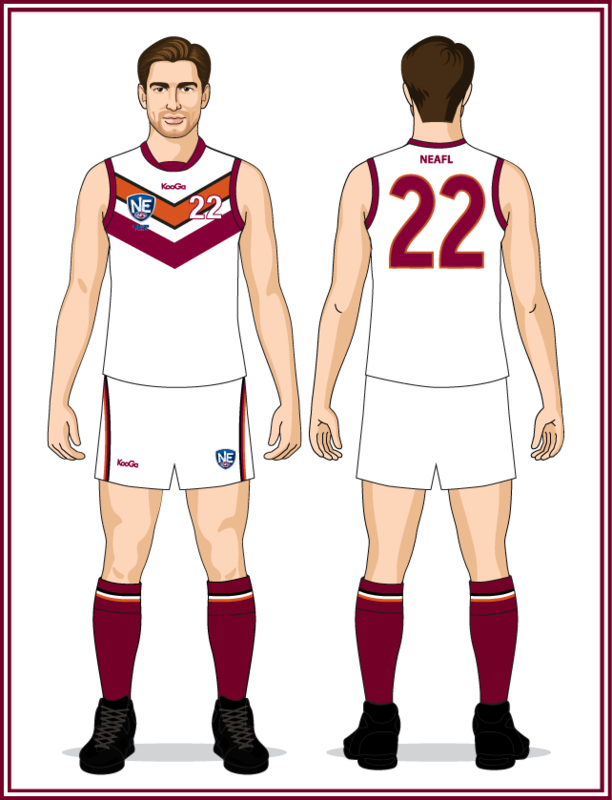 The NEAFL logo replaced the AFL Queensland logo that was worn in 2011. 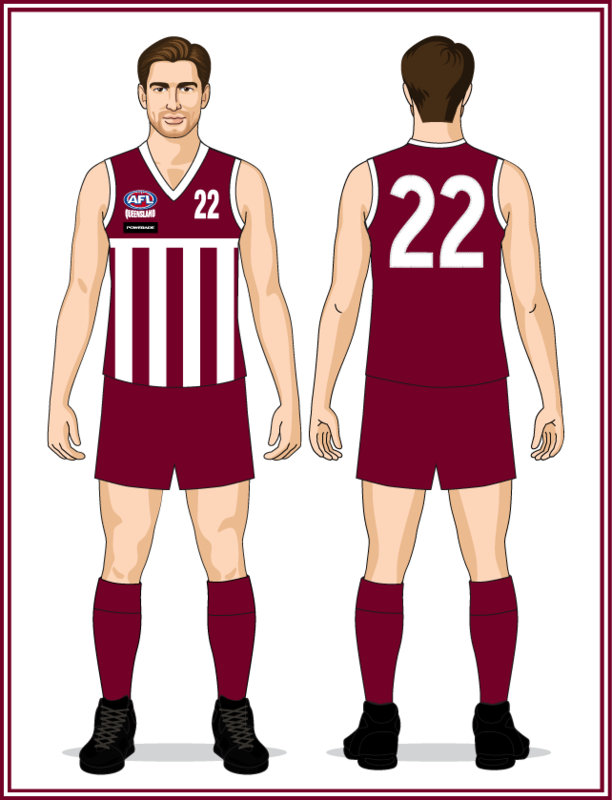 The front number returned to the jumper front and, as the away team, white shorts were worn instead of maroon. Otherwise, this jumper was the same as the 2012 design. The NEAFL moved away from selecting separate representative teams for each conference (NEAFL North and NEAFL East) in favour of a single representative team featuring the best players from both conferences. This opened the door for AFL Queensland to resume representative football. 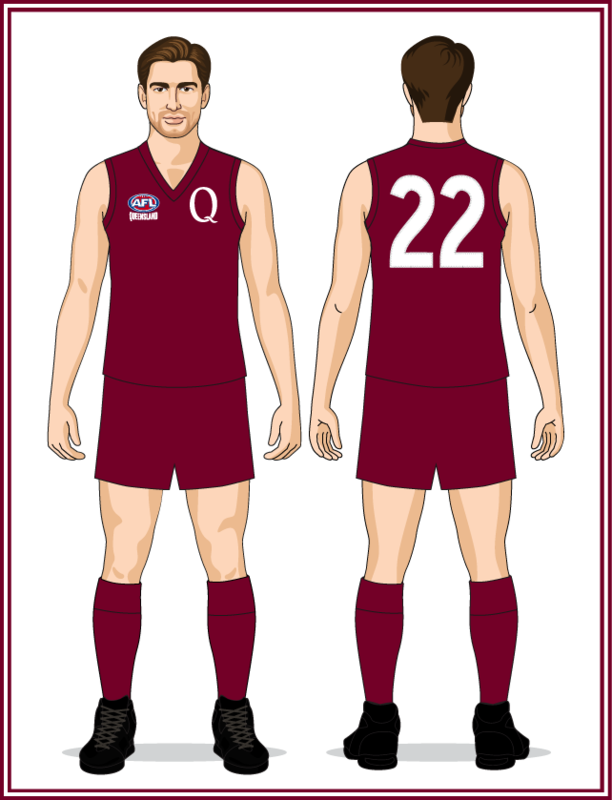 - a unique "Q" unlike any others to previously appear on the Queensland jumper. - this was incorporated in the new AFL Queensland logo. - the word "QUEENSLAND" on the league's logo was replaced by "STATE TEAM" on the representative logo. - a new apparel sponsor (BLK) replaced Kooga. - front number replaced by text describing the type of match (STATE GAME), the names of the competing teams, and the date of the match.